Vladimir Putin once dissed George W. Bush's dog and Dubya has NOT forgotten. If you couldn't stand George W. Bush for eight years but the current state of the dumpster fire has softened him for you a bit, watching the confident way he dances his way onto the Ellen DeGeneres set may rekindle some of your old fires. And when the former president classifies "symbiotic" as a "big word," you might be tempted to close your browser, unplug your internet, and build a blanket fort you can live in until the world ends. Then again, George W. Bush has a marvelous anecdote about his dog, Barney. The story starts around the 5:10 mark and has everything to do with Vladimir Putin, Vladimir Putin's dog, and how you can tell a lot about a Vladimir Putin by the way he treats your dog. 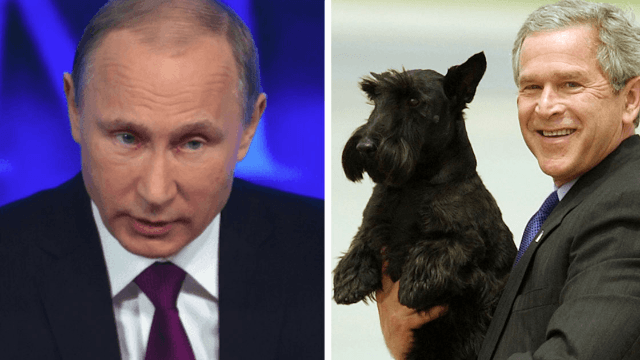 "He kind of dissed him," said Bush, referring to Putin's first meeting with the then-president's little Scottish Terrier. "He looked at him like, 'You think that's a dog?'" Fast forward to a year later and Putin asks Bush if he'd like to meet his dog. "Yeah, I'd like to meet him," responds POTUS. "And out comes a giant hound, kind of loping across the... yard." Now comes Bush's impression of a dog running and it looks like an eagle flying. The guy's so American every animal moves like an eagle in his mind. "And Putin looks at me and says, 'Bigger, stronger, and faster than Barney.' And uh, it speaks volumes when you listen to what somebody says. So in other words, he's got a chip on his shoulder." At this point, Ellen is rapt. Then Bush drops the conclusion, and this has all been his way of saying, "Putin will push and push and push until somebody stands up to him." And you realize it's all a way for 43 to throw more shade at 45. Again, you might think it's annoying that George W. Bush uses a folksy anecdote about a dictator's dog to prove he's "got a chip on his shoulder," rather than pointing to his terrifying record regarding civil rights, war, and free press—but hey, this is 2017, not 2005. You've got more pressing politicians to needle. And no one should call small dogs anything other than adorable and a little insecure.